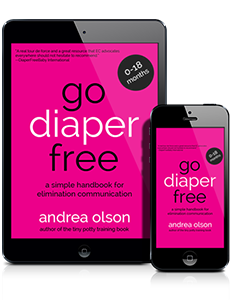 During the next four weeks of the Go Diaper Free Podcast I'll be going over the four easy catches! 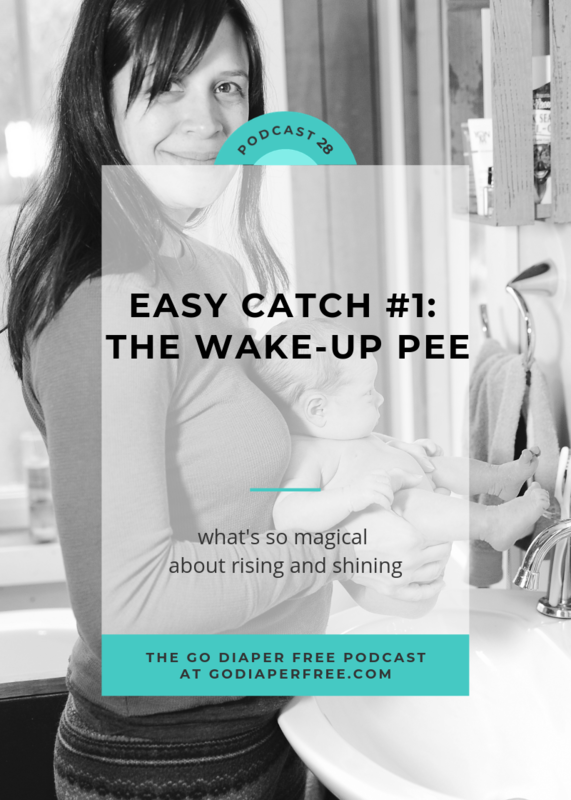 Today's episode is all about Easy Catch #1 - The Wake Up and Pee. If you've just started EC, it may feel a bit overwhelming, and that is perfectly normal. Easy catches are a gentle and easy way to test the waters, so to speak, and begin to experience what elimination communication(EC) is all about! We'll go over methods for implementing Easy Catch #1 with children of various ages, from newborn through toddler. Whether you want to eventually transition to full time EC, or you just want to familiarize your child with the potty and eliminate a few diapers, you can take advantage of a time of day when you are likely to experience success - when your child wakes up from a nap or nighttime sleep. If you want to access all past episodes and subscribe to be notified of new episodes as I publish them, please visit us over on iTunes and click subscribe there. Lastly, if you like the podcast and have a sec to leave a review, please do so here. It means the world to me (in that more new parents discover EC the more people leave reviews...yay!). Have you tried Easy Catch #1? Please leave a comment below with your experience! DS, 5 months, cries if I put him on a potty before the breast. But then he’ll pee while he nurses. I wish we had started at birth instead of 4 months! It’s GREAT that you started at 4 months, Vanessa! If you have any more babies, you’ll definitely get to start at birth, but you’re here now and that is awesome. You can always nurse him over a waterproof pad or have a top hat potty handy – https://tinyundies.com/tophat – and my book goes over a ton of options for pottying during nursing – https://godiaperfree.com/thebook – in case you don’t have that yet. Bottom line: this will pass, soon, so hang in there! I just started EC with my DD when she was between 6-7 months old. I thought I would never catch this “easy catch”. When she would wake up she typically had already gone in the diaper but I would offer a pottytunity anyways. It’s been one month and she’s starting to hold it and peeing once I get her to the potty (or as the diaper is coming off ?). Stick with it, we’re all learning! Thanks Andrea! I’ve always tried to do wake up and pee with my now 2.5 year old son, my challenge is sometimes in the morning he has an erection and I think that’s one of the reasons he resists at that time. I don’t want to push him to do something uncomfortable if that is the case but the morning pee is obviously one of the keys to getting out of nighttime diapers. Has anyone else had this challenge, any thoughts? this is really helpful! Usually I miss the wake up pee because my 3 month old has woken up without me realizing it. She’s just so chill and happy in the morning! But I’ll definitely start offering the potty at wake up more faithfully because she’s certainly caught onto the potty routine at other times of the day just in the one month that we’ve been doing it. Thanks! We started EC with our 9 month old and have been doing it part-time about 3 weeks. I had a really amazing week in which I caught every morning pee and poop. The next week was just a bit haphazard where I just kept being busy when she wasn’t going and missed it, and I was so discouraged! This week has been better so far. Last night I even took my daughter to the potty every time she woke up in the night and cried, and she fell back asleep pretty quick. If I hadn’t missed her first morning pee this morning (I though she would go back to sleep as it was 5am…), she would have had a dry diaper this morning! WHAT, I would never have thought that possible as I have had to really work on a good overnight cloth diaper for her, and g diapers didn’t seem that comfortable and I feel conflicted about disposables. Usually in the morning she pees about 3 times in 45 minutes. 1-2 min. after she wakes up, 20 min. after she wakes up, and after she nurses or eats food. We have both a little potty and a potty toilet seat. Thank you for the encouragement and insights, Andrea! #1 gave me the confidence to keep going with EC. We have been doing EC part time, mostly on waking (and offering on diaper change), for a couple of months (he’s 4.5 months now). Most of the time, our son will pee! It’s great. We’re just working to teach him that there is another place to go other than his diaper. Hi Maria! You do not have to cue the entire time he is going potty. Once he is going and you have acknowledged it, you can move on to singing or just talking with him.